Prometheus, one of the Titans in Greek mythology, was the god of fire. A master craftsman considered the wisest of his race, he was credited with the creation of humans and with giving them fire and various types of skills and knowledge. His name means "forethought." Prometheus was the son of the Titan Iapetus and of either the sea nymph Clymene or the goddess Themis. Atlas* and Epimetheus ("afterthought") were his brothers; Hesione, daughter of the Titan Oceanus, was his wife. When Zeus* and the other Olympian gods rebelled against the Titans, Prometheus sided with the gods and thus won their favor. He held Zeus's aching head so that Hephaestus (Vulcan)* could split it open and release the goddess Athena*. To show her gratitude, Athena taught Prometheus astronomy, mathematics, architecture, navigation, metalworking, writing, and other useful skills. He later passed this knowledge on to humans. Champion of Humankind. Prometheus created humans by shaping lumps of clay into small figures resembling the gods. Athena admired these figures and breathed on them, giving them life. Zeus disliked the creatures, but he could not uncreate them. He did, however, confine them to the earth and denied them immortality. 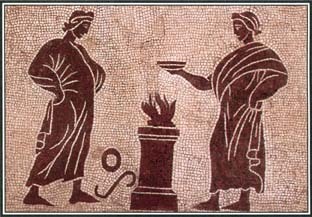 Prometheus felt sorry for humans, so he gave them fire and taught them various arts and skills. Prometheus was given the task of determining how sacrifices were to be made to the gods. He cut up a bull and divided it into two portions. One contained the animal's flesh and skin, but they were concealed beneath the bull's stomach, the least appetizing part of the animal. The other consisted of the bones, wrapped in a rich layer of fat. Prometheus then asked Zeus to choose a portion for himself, leaving the other for humans. Fooled by the outward appearance of the portions, Zeus chose the one containing the bones and fat. Prometheus thus ensured that humans got the best meat. Angered by this trick, Zeus punished humans by withholding fire from them so that they would have to live in cold and darkness and eat meat raw. Prometheus promptly went to Olympus*, stole a spark of fire from Hephaestus, and carried it back to humans. When Zeus discovered what Prometheus had done, he swore revenge. He ordered Hephaestus to create a woman from clay, and he had the winds breathe life into her. Athena and other goddesses clothed the woman, whose name was Pandora. Zeus sent Pandora as a gift to Prometheus's brother Epimetheus, who married her despite warnings from Prometheus not to accept any gift from Zeus. Pandora brought with her a box containing evil, disease, poverty, war, and other troubles. When Pandora opened the box, she released these sorrows into the world, and Zeus thus gained his revenge on humankind. In Greek mythology, Prometheus was a wise craftsman who taught humans many useful skills, including navigation, writing, and architecture. Here, Prometheus gives fire to man. Prometheus's Punishment. To punish Prometheus, Zeus chained the god to a rock on a mountain peak. Every day an eagle tore at Prometheus's body and ate his liver, and every night the liver grew back. Because Prometheus was immortal, he could not die. But he suffered endlessly. Prometheus remained chained and in agony for thousands of years. The other gods begged Zeus to show mercy, but he refused. Finally, Zeus offered Prometheus freedom if he would reveal a secret that only he knew. Prometheus told Zeus that the sea nymph Thetis would bear a son who would become greater than his father. This was important information. Both Zeus and his brother Poseidon* desired Thetis, but they arranged for her to marry a mortal so that her son would not pose a challenge to their power. Zeus sent Hercules to shoot the eagle that tormented Prometheus and to break the chains that bound him. After his years of suffering, Prometheus was free. To reward Hercules for his help, Prometheus advised him how to obtain the golden Apples of Hesperides, one of the 12 labors the famous hero had to accomplish. Legacy. The story of Prometheus's suffering and ultimate release from his torment has inspired artists and writers for centuries. Among the most important early works dealing with the myth were a series of plays written by the Greek playwright Aeschylus. Only one of these works, Prometheus Bound, survives. The Roman poet Ovid incorporated parts of the story in his work the Metamorphoses. Prometheus has also been the subject of more modern works of art, music, and literature by such individuals as the composer Beethoven and the poets Byron, Shelley, and Longfellow. See also Atlas ; Greek Mythology ; Hercules ; Pandora ; Titans ; Vulcan ; Zeus . how is macbeth related to greek mythology? how is macbeth related to prometheus? I am trying to cite this source using parenthetical documentation, but I cannot find the aughtor of this article. Who wrote it? I am requesting permission to reproduce the image of Prometheus giving fire to man from your website.. I would like to use this figure in a textbook I am preparing for publication later this year by Taylor and Francis. The book is called Energy and Society, and will be the second edition of this book. I would use this figure in the chapter on Fire. Of course I will be pleased to acknowledge the source in the book.